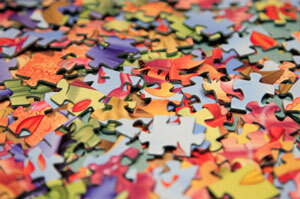 We have a jigsaw puzzle out on our kitchen table right now that my husband and sons constructed a few weeks ago. It was a good activity for a snowy evening; the three of them worked almost silently as they each tackled a section piece by piece. As puzzles always go, after much trial and error all the pieces went together in the part they were working on individually, and they joined their 3 large sections together to create the entire picture. Then it all made sense. The work was finished and now there was a small masterpiece to behold. Our family has just come through a time where we've had to wait a long while before any of the pieces of the life puzzle we were trying to put together made sense. For months we just kept pushing the pieces around the tabletop, trying to make them fit with this or that one, but we never got the connection we sought after. Despair and frustration ruled in force; unanswered prayers went up constantly; fear and dread managed most of our days. Then this past weekend, the first piece found its partner. Then another did. And another. Without fanfare or preamble or introduction, God worked silently to start to join the tattered edges together so that one of these days we are going to behold the whole masterpiece. I've waited a long time to see even a bit of the puzzle come to life, and I'm starting to make out a bit of the picture that's emerging as each day gets us a bit closer to having it all make sense. God is in the waiting. God designed the puzzle. And God will put it all back together again one of these days.